The saying “Fail fast, fail often” has become a mantra for today’s entrepreneurs, especially among the more aggressively innovative and disruptive ones. Clearly business people shouldn’t be afraid to try out new ideas as a natural process to ultimately achieving (hopefully) great success, even if many of those ideas fail. And if you’re going to have to fail, why not do it as fast and painlessly as possible so you can move on to better things before it’s too late? But this quote sends a decidedly mixed message to business people steeped in a culture like ours where winning is everything and too much failure or one big, terrible disaster could permanently damage your ego, reputation and ability to build a business. It also doesn’t address an important reality: one of the hardest things for business leaders to do is recognize, much less accept, failure – big or small. While some people can live with a bad situation until it’s too late, many more, especially younger entrepreneurs, often declare failure as soon as things get too difficult. Most of the time this is due to the lack of experience that helps them discern the good from the terrible and/or because of underdeveloped decision-making abilities. Good decision-making is about knowing when to rely on gut instinct, when to ask experts, trusted advisors and your team or when to go to conferences and read to learn from those who have faced similar issues. “Going with your gut” may be a good and efficient way to deal with simpler, day-to-day problems, providing you have the right kind of experiences for your gut to draw on. But without making the effort to explore multiple solutions to a very knotty issue you might be doomed to repeating unnecessary and costly mistakes again and again and/or fail one too many times. Short-term problems: These can be usually resolved with a minimum of analysis and discussion. If not handled quickly and decisively, however, situations like an angry customer or a production delay can quickly spiral out of control and become a lot worse. Use advisors carefully and quickly. Long-term issues: These are problems that don’t have an immediate or easy answer. They can include marketplace – customer or supplier – disruption, lack of proper management or oversight, faulty planning and many other issues. In most cases these situations require a lot of experimenting with solutions that come out of questioning, listening and discussions with people you trust. There is always the possibility that you won’t find the right solution but at least you can say you tried. Outright failure: The kind of misfortune that pushes businesses into bankruptcy usually occurs when there is no operating capital left and additional funding is unavailable. Sometimes it is caused by personal burn-out or missing so many important targets that you are forced out of your position, even, as in the case of Steve Jobs, you are the founder of the company. 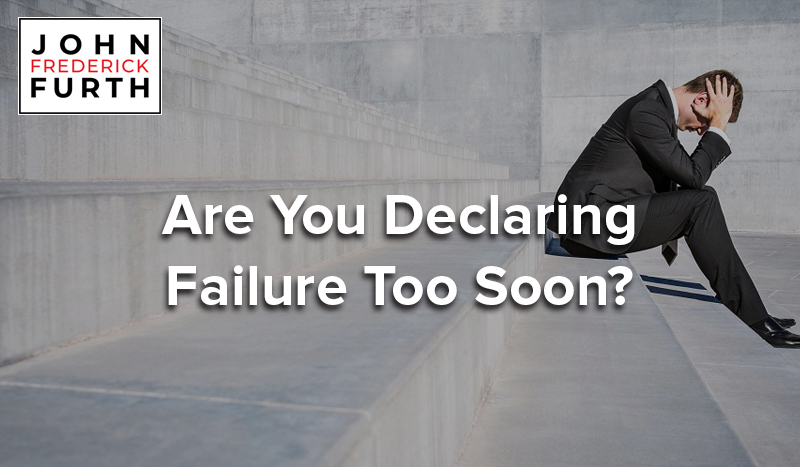 By the time you declare failure, it can almost come as a relief, even if it’s extremely painful. By gathering a wide variety of perspectives when faced with long-term issues and experimenting quickly with possible solutions you have a better chance of avoiding the last category. But this also takes time, patience, intestinal fortitude, and often a good deal of resources, financial and otherwise. Indeed, you will have to be ready to call it quits when you’ve exhausted a lot of possible fixes. So, go ahead and fail, but confine them to small breakdowns and make them early on when there’s trouble so that short-term problems don’t become long-term issues that might turn into the kinds of big, whopping, debilitating failures that could negatively impact the trajectory of your business and your life.